Is a famed Ninja of the Hand that faces off against Black Widow, Daredevil and Elektra. Fall from Grace - Digital Promotion - How cool is this thing! Covers from Daredevil "Fall from Grace"
Unlike most members of the Hand, Osaku is not Japanese. Osaku is a Russian who became frustrated with dealing with Kremlin and defected to the Hand. Born Karla Romanova she was highly trained by the Russian government to seek out and kill the Black Widow who had defected to America. The Black Widow defeated her. Unsuccessful in her mission she is contacted by her Russian superiors to her that her mission has been canceled. Karla does not want to stop hunting the Widow and instead joins the Hand. Osaku is a character in the Daredevil story known as Fall from Grace. In this story she battles Daredevil with the Hand searching for a special telepathic virus known as About Face. She follows the orders from Lord Daito. In doing so he faces off various heroes that includes Daredevil, Elektra, Shang Chi. As a member of the Hand she is able to use her old Russian affiliates to infiltrate the US government's Pentagon facility and steal the files on the About Face virus. This leads the Hand to pursue SHIELD agent John Garrett whom Osaku helps apprehend with the help of Tekagi. She is apprehended by the Black Widow but manages to escape. Osaku then goes on a mission from the Hand's new leader Tekagi to help retrieve select innocent people whose blood sacrifice to the sword of the Hand could cause the Sword to regain its resurrection powers. Osaku's target is Singer Tsikali. 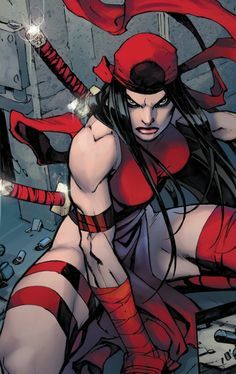 As she takes part on her mission she is killed by Elektra. Osaku also appears in the Root of Evil Storyline. Resurrection through the demonized sword Sakki. More about Daredevil "Fall from Grace"